Prepaid methods are incredibly easy to use at web casinos, making them a great alternative if you don’t have a compatible payment method. There’s quite a few options available ranging from permanent cards to disposable vouchers and these are accepted at the casinos detailed in the table below. These casinos are all secure and implement advanced gaming technology in order to ensure transactions, including prepaid deposits, are safe. 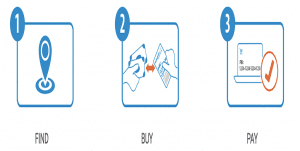 Prepaid deposit methods are pre-loaded cards or vouchers which have a set amount of cash funded on them and can be used similarly to a credit or debit card or by entering a code, respectively. The method means your name is never entered, nor is any financial information which is linked to your personal bank accounts and therefore creates a strong layer of security. Pair this with the online casinos above which all use encryption technology and ensure their games are fair and you will have an enjoyable and secure gaming experience. There are a fair few prepaid options available at the online casinos detailed above, including options in both the card and voucher option. Paysafecard, despite its name, is a voucher which can be purchased at retail outlets or online. It features a 16 digit code which is entered when making a real money deposit. 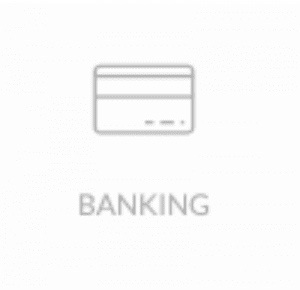 The service is a branch of the Skrill Group, which offers an e-Wallet, you can locate it via their store outlet on the website or via the online store also accessible through the paysafecard website. There is a maximum limit of $100 per voucher, and only 10 can be purchased in one transaction limiting high roller’s bankrolls. Additionally, the minimum amount available is $10. 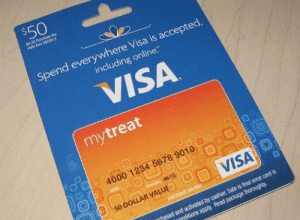 Big global brands also offer players a prepaid option with prepaid gift card, travel cards, and everyday cards available by Visa and MasterCard. You can purchases these cards from retail outlets, including Australia Post where you can get a Load&Go Reloadable Visa Prepaid Card and Coles where you can purchase a Reloadable MasterCard. The term reloadable means, unlike paysafecard, they can have funds loaded on them again and again – the card doesn’t become disposable after you’ve used the initial amount on the card. You can then use these cards at the online casinos similarly to credit and debit cards by entering the number on the card, the expiry date and the three numbers on the back of the card (CVV). If you need to enter your name enter ‘Valued Cardholder’ in the name field. Be sure to have enough funds on the card otherwise it won’t work – you can recharge these cards online at at the retail outlets you purchased the card from. Flexepin is incredibly similar to paysafecard in it is voucher featuring 16 digits which you purchase with a pre-loaded amount on it. It is a fairly new payment method but it is on par with the aforementioned prepaid options. Users can only purchase the vouchers at retail outlets, available all around Australia, with a maximum of $500 available per voucher and up to 10 vouchers eligible to be purchased in one go. This option may be better suited to high rollers looking for a prepaid voucher. The minimum amount available is $20 – a bit higher than paysafecard’s $10 minimum – but it might be better to opt for this voucher as it offers insurance if your voucher is lost or stolen. Contact customer support if this happens to you. 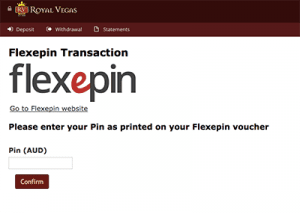 Flexepin can be found at all our Microgaming online casinos including Royal Vegas Casino, All Slots Casino, Casino-Mate, and Platinum Play. There are pros and cons to using this type of method at an online casino, take a look and decide whether this method is best for you. Prepaid methods have a number benefits which you may find are suited to your needs when funding your online casino account. You’re in control of how much you spend – having a prepaid card means you can load a specific amount on the card and once you’re out of funds you can’t top up at the online casino quickly and without thinking. We recommend Raging Bull Casino as our top-rated real money casino site for players from United States, which has some excellent welcome bonuses available for new players who deposit cash for the first time, along with a great range of secure deposit methods to choose from.